There’s no better combination than fall jewelry designs and leaf-shaped beads. I’ve always been a big fan of Czech glass leaves, with their gorgeous colors and smooth surfaces, but there are many wonderful possibilities when it comes to leaf beads like drops, pendants, and findings. I’ve put together a fantasy list of some beautiful examples. 10. Handcrafted wood maple leaf beads from The Beaded Bead. 9. Turquoise composite leaf pendant from AuntiesBeads.com. 8. Fern green Swarovski pure leaf pendant from ArtBeads.com. 7. Amber with black stripe Czech leaves from FusionBeads.com. 6. Raku maple leaf pendant from LimaBeads.com. 5. Vintaj Natural Brass tangle wood leaf charms from Beadaholique.com. 4. Lava red Czech glass leaves from Bobbi’s This n That. 3. Copper plated genuine birch leaves from HappyMangoBeads.com. 2. Orange, white, and black Czech leaves from The Best Beads. 1. And my personal favorite, jet marbled Czech leaves from The Beady Eye. 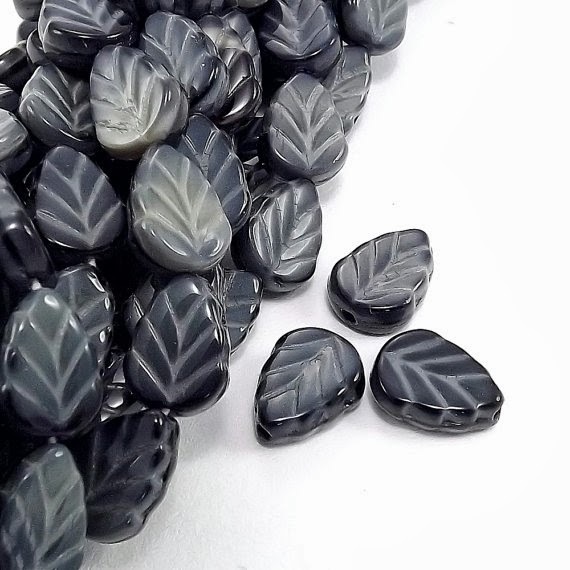 What’s your favorite type of leaf bead? How do you like to use them? For this month’s necklace collage, I was hoping to find a great statement necklace with bold orange beads - something pumpkin-y that would be perfect for fall outfits. I was picturing some leafy green ensembles with perhaps a hint of warm yellow. But when I went on the hunt for some great orange jewelry, I came across an exciting skull charm necklace with orange leather and shell dangles. It was too good to resist. With this necklace as a starting point, I switched gears and opted for a more Beetlejuice inspired look - stripes, black and white, and spookiness. Although I don’t normally go for printed tops, I thought that something graphic would make a great backdrop for skull beads, and found one that went perfectly with the gold and brown palette. To bring back a hint of pumpkins, I added a Chan Luu bracelet with orange rounds. 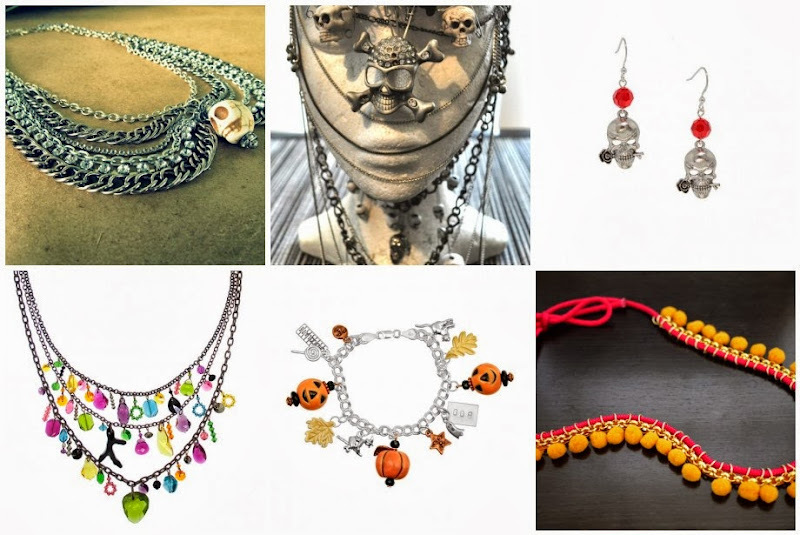 The skull necklace features a lot of great jewelry elements that work well in fall outfits. Below are some fun tutorials to try for similar looks. If you like to go authentic, try out Ouija Bored’s bird skull necklace tutorial, which includes instructions for cleaning and preparing real animal bones. Do you like to use skull beads in your designs? Are you incorporating beads into your costume this Halloween? I haven’t made much progress in the timetable department since last week, and I still feel as if I’m just spinning my wheels as the to-do list gets longer and deadlines get closer. Hopefully things will start to smooth out as the holiday seasons gets nearer - I wouldn’t mind being organized and on schedule by then! I have managed to move on in beading though, and I’m really excited about my current project. The design is an old favorite - a chevron chain lariat with fringe. This time I’m using Ptah the god of craftsmen as my inspiration, which gave me lots of room to play with accent beads. I’m looking forward to incorporating some new bone tubes and a few glass scarabs, along with lovely cobalt blue white-hearts. This month’s giveaway had a fantastic turnout - thank you so much to everyone who entered! With the help of Random.org, a winner has been selected to receive two packs of gorgeous Picasso finish beads from Dream Jewelry Supplies. Congratulations to Sue, and happy beading! I would like to extend many thanks to Dream Jewelry Supplies for providing this giveaway. Inspirational Beading readers can still save 10% on orders of $100 or more with coupon code DREAM10 in the shop. Do you ever feel like no matter how much you get done, there’s never enough time for all that’s left? My schedule this past week has left very little time for beading, so I’m still working on last week’s cuff bracelet. The longer it goes on, the more rushed I feel when I think about the rings I want to make before moving on with the next piece for my Egyptian Gods challenge. The good news is, I’ve nearly finished the herringbone work, so hopefully I’ll be able to finish most or all of the embellishments by tomorrow. If I can just squeeze in an extra hour or two of dedicated beading time, I can probably get back on schedule without cutting anything out of my to-do list. With several different deadlines looming, and a few too many side projects and everyday duties pulling me in every direction, I’m seriously considering doing an overhaul of my timetable and activities. We recently implemented Kaizen at my day job, and it’s starting to look like a good idea around here as well. What are your favorite timesaving techniques? Of all the wonderful colors and shapes that remind us of fall beauty, is there any more charming than a plump orange pumpkin? Whether they’re in cute and crafty kids decorations, elaborately carved, baked in a pie, or dressed up for a chic Thanksgiving table setting, pumpkins are almost always cheerful. Now that the back-to-school season is behind us, and it’s about time to start planning Halloween costumes, I wanted to explore some fun color palette ideas with a focus on pumpkin orange. I started with the most adorable carved bone rounds from Happy Mango Beads. Dyed a bright marigold with vertical stripes, they stand in perfectly for pumpkins. The challenge would be to create memorable seasonal palettes that aren’t too Halloween-y. I started with an easy contrast - purple lined Rosaline. The purple is vibrant and lively, making it a perfect match for the zingy orange. To add even more light and a bit of balance, I completed Putting Up Preserves with some juicy transparent cherry. Although this palette is very fruity, the presence of orchard - and not tropical - colors makes it ideal for autumn. Next I tried some jet black, which really enhances the bright orange. Since it’s so light, the combination is still far from ordinary, and I thought it would be safe to add some olive green. I love the mossy quality of this shade, and it goes so well with other earthy hues. As a trio, these colors are very organic, like Carving a Pumpkin straight out of the garden. For the final palette I included some additional accent beads. I couldn’t resist the seed-pod shape of turquoise Rizos, which also contrast beautifully with the orange bone beads. While picturing the drops in wheat sheaf clusters, I added some warm and sunny transparent topaz to create Bailing the Hay. What are your favorite combinations for orange? After working on two three-bead netting projects back to back, I’m starting to feel like I can’t remember how to do netting any other way. Although the technique is much more time consuming, it really makes a gorgeous collar. 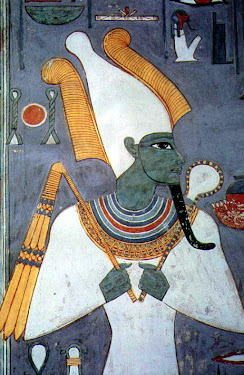 When I first set out to make a project for the Egyptian god Osiris, I knew that a collar was the way to go. In his familiar mummified form, Osiris can usually be seen wearing a collar, and closely stitched netting could provide an opportunity to incorporate a wrapped linen pattern into the beadwork. This idea fell through, but the necklace turned out great anyway. I combined two shades of blue with black for the ‘jewelry’ portion of the pattern, then wide rows of opaque white and bone for the ‘mummy’ bits. Since Osiris could have either blue or green skin, I had planned on adding some emerald to the inside row, but found that the black not only looked better, but fit better as well. I have more plans for using three-bead netting in the future, along with some experiments with new materials. I’ve gotten a little ahead of schedule with the Egyptian gods, and the challenge should be wrapped up nicely come December! Is there any finish more beautiful or inspiring than Picasso? The earthy, rustic quality of Picasso finish glass is perfect for fall jewelry, vintage inspired pieces, and organic designs. There’s really nothing like it. If you love Picasso finish beads, or just have a taste for Czech glass, this giveaway is for you! 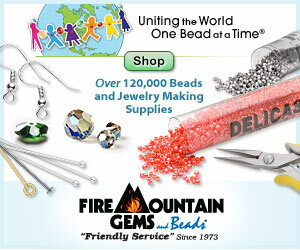 Inspirational Beading sponsor Dream Jewelry Supplies is offering up some delicious bead mixes. The prize includes a 25 gram SuperDuo mix featuring turquoise and topaz, and 25 gemstone donut 11 mm rondeles in a gorgeous Picasso palette. For a chance to win the beads shown, head over to Dream Jewelry Supplies and check out the inspiring selection of beads and findings. Then leave a comment here on Inspirational Beading, and let us know which beads are your favorite. Anything goes! Important: Comments must be made here on the blog to qualify. Please make sure to include a contact method in your comment, or through your profile, so that I can get in touch with you if you win! Incomplete entries will not be entered into the final draw. One lucky winner will be drawn on Wednesday, September 18th. This giveaway is open to all international readers. Inspirational Beading readers are also invited to save 10% on orders of $100 or more with coupon code DREAM10. This week’s bead tray is looking neat and tidy, since I’m right between projects. I’ve just finished up a new ring duo that I couldn’t wait to complete. I had a sudden brainstorm for candy corn palettes that just had to be made. I had been planning on doing both rings in the same pattern, but with the colors reversed. Unfortunately, my orange and yellow beads are slightly different sizes than the black and white. So I had to change my plan and go with stripes for the second piece, and it turned out to be my favorite of the two. I’m still taking a quick break from the Egyptian gods series to make a new herringbone bracelet. This is another one of those Ideas - out of nowhere I had a vision of a giraffe pattern bordered by tropical green and orange. I didn’t have quite the right colors to make it happen, so I’m going with black and white zebra stripes instead. Should be fun! Last week’s collar is finished and ready to enter the shop. I ended up leaving out the emerald green and finished the inside row with black. It worked out well, since the Czech seed beads provide a small variety of sizes and I could choose the ones that I needed to get the right shape. From the year’s first falling leaves to fresh new boxes of crayons, September is a month that is full of color. This month, my favorites beads are no different. Bold colors and unique shapes are calling to me whenever I browse through my stash. I’m working on some prototypes for new necklaces this month, trying out some really cool materials and taking my designs in a different direction. These large African Christmas Beads from Happy Mango Beads are coming in really handy. 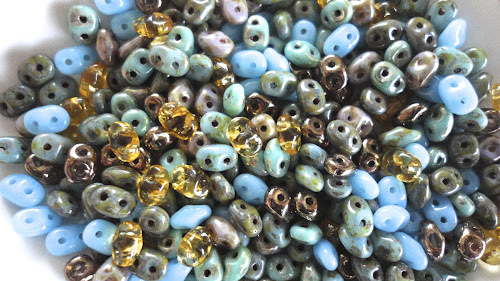 No matter what I’m working on, these colorful and classic looking beads always cheer me up. I’ve been including natural beads into my work more and more lately, so when I spied this strand of zebra pearls on sale at Auntie’s Beads, I couldn’t resist. Nothing beats stripes when you want to add a little personality to beadwork, and the red wine color is perfect for fall. I'm picturing these pearls with some olive green and squash orange, perhaps. Last but certainly not least, I finally got around to trying out some new tagua shapes. These donut slices from Lima Beads are simply gorgeous. They have the smooth, lightweight feel that I love about tagua, and the shape is very inspiring. When it comes to tagua beads, I find that I’m especially drawn to the unique cuts that show off the original shape and texture of the nuts, rather than traditional bead shapes. These pieces have lots of personality. Are you excited about a new bead style this month? What have you been working with? This week I’m working on a new ‘traditional’ netted collar, using a palette inspired by the Egyptian god Osiris. I’m on my third attempt at getting the right pattern, and finally things are moving forward. Originally, I had wanted to create a pattern within the white and beige sections to mimic overlapping linen wrappings, but couldn’t get things to flow the way I wanted. In the end, I decided to make these sections wide, and split the remaining colors into halves instead. So far I’m happy with the results. This piece will put the new collar technique to the test again, as this time I’m using beads of all the same size and shape, with the exception of some emerald Japanese seed beads that I hope to use in the final row. Next the plan is to tackle some shaped netting and more complex patterns. There’s nothing quite like a beaded cuff to show off the marvel of tiny seed beads. With the right combination of colors and stitches, you can have a bold and beautiful bracelet that fits like fabric. The only thing that can make a beadwork cuff even better is the addition of some choice accent beads. This project combines the visual appeal of an ombre palette with the added texture and delight of disc bead accents. We’ll also explore an easy way to attach clasps to beadwork that can be applied to a variety of stitches. Start by arranging your seed bead colors from dark to light, or warm to cool. You can use 6 different shades of one color, or blend from one color to another. 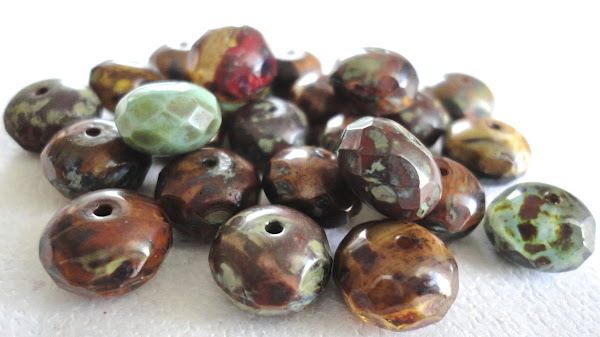 Try placing your bead packages in different positions until you get a pattern that is has a pleasing ombre look. I like to start herringbone weave with a two-bead ladder, but you can also start with a single-bead ladder, or use the Ndebele technique. Check out the Twisted Tubular Herringbone Tutorial for full instructions on making a two-bead ladder. Begin with 3 columns of each color in your chosen pattern, so that you have 18 columns in all. Step up to begin the first row of herringbone weave: stitch up through the bead next to where your thread is exiting, and up through the last bead in the top of the ladder. Pick up two seed beads - making sure that they match the first and second columns below - and stitch down into the first bead next to where you thread is exiting. Pull snug so that the beads lock into place side-by-side. Stitch up through the next bead in the row below and pull tight. Continue adding two beads at a time, matching them to the pattern, until you reach the end of the row. Remember to step up through the following base bead at the end of each stitch. You can work in whichever direction is most comfortable for you. After adding the final bead pair, pull the thread snug, and then step up to start the next row: Stitch up through the bead next to the one that your thread is exiting, then up through the last bead added in the previous row. Pull tight, and flip the beadwork over. Continue adding rows of herringbone weave until the beadwork reaches the desired length, adding new thread as needed. You’ll need to allow a bit of length for the clasp - about half an inch or 1.5 cm. The clasp will overlap, so the final length is adjustable. Once the final row is added, you can cinch up the beadwork so that both ends match: stitch a dummy row by following the herringbone thread path, but without picking up any beads. Step up through the second column from the end, and stitch up and down the top two rows to connect the remaining columns together. There should now be threads between each of the beads along the edge. Weave in your threads and trim. 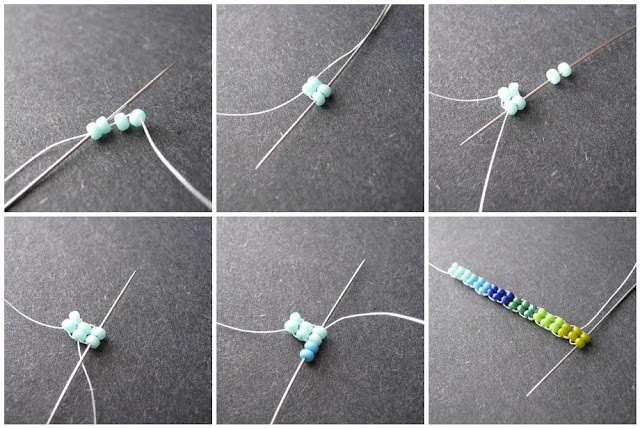 Secure a new length of thread in the beadwork, near one end. (If desired, add straight fringes to the edge of the beadwork using two or more beads of matching colors.) Exit from the 8th column, and pick up enough seed beads to form a loop that will fit your clasp. Stitch down into the beadwork through the 11th column and pull snug. Retrace the thread path through the seed bead loop at least once more to strengthen. Continue adding fringes to the edge is desired, then weave in your thread and trim. Secure a new length of thread at the opposite end. Test the length of the bracelet, and determine where you would like the second half of your clasp to rest. Count back 3 beads, and exit from one of the center 2 columns at this point. Pick up 3 matching seed beads, your clasp, and 3 beads to match the corresponding column in the cuff. Stitch into the beadwork, then retrace the thread path at least once more to secure the clasp. Add fringes to this side of the cuff, then weave in your thread and trim. Arrange your disc beads on the cuff in a pattern you like. Take a picture or make a quick sketch if necessary. You can also add embellishments freeform for an organic look. Secure a new length of thread near the point where you would like to add the first disc. Make sure that you are working from the same side as your button or toggle, so that the accents will face out! Weave through the beadwork and exit from your start point. Pick up one disc bead, one heishi or 8/o bead, and one seed bead to match the closest row in the cuff. Skipping the seed bead, pass through the larger two beads, and through the cuff below. Pull snug, making sure that there is no slack thread in the stack of accent beads. Pass through 2 seed beads from the underside of the beadwork, then two beads in an adjoining row - follow the herringbone thread path. Continue adding your accents, adding thread as needed. Weave in your threads, and you’re done! There are so many fun color and pattern possibilities for this project. If you make a variation, share it on Facebook - I’d love to see what you come up with!